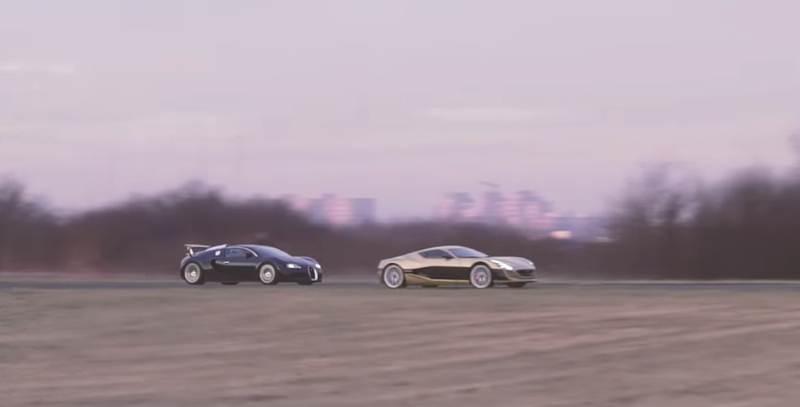 The Rimac Concept_One has been taking down some of the quickest hypercars in drag races and now it has turned its sights on the Bugatti Veyron. The result is a demonstration on how we are entering a new age of performance cars powered by batteries instead of pistons. It’s amazing to watch scrappy EV startups like Faraday Future and even more established brands like Tesla engineer everyday passenger cars that can put down acceleration numbers that would absolutely embarrass exotic cars from companies with a much longer performance pedigree. For the longest time, the Bugatti Veyron was the king of acceleration and power for a production car. While the Veyron may still hold the title for top speed, an electric supercar from Croatia, the Rimac Concept_One is out to be the sprint champ. The Rimac Concept_One uses four electric motors each with its own gearbox and has a total output of 1073 HP and 1180 lb-ft of torque. Keep in mind that all that power is transmitted immediately to the wheels. The video below is an awesome demonstration on how that transfer of power allows the Rimac to get a serious jump off the line compared to the legendary Bugatti. Of course, the Bugattis piston driven horsepower will eventually overtake the Rimac as the two race beyond the quarter-mile, but it’s only a matter of time before an EV becomes the fastest car in the world.